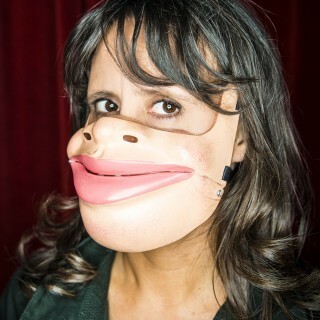 You could go and see Nina Conti every night and be guaranteed of a different experience. It depends who’s in the crowd and Nina admits her audience are her show, but she is doing herself a disservice and she deserves credit for how clever she is. Part of her act is dedicated to her alter ego – Monkey – a cheeky, naughty hand puppet, who has revived the forgotten act of ventriloquism. Who remembers the likes of Emu, Spit the Dog and Orville? They got the stuffing knocked out of them long ago and are now limply languishing in a puppet show in the sky. When ventriloquism is done well, it’s admirable and Nina has perfected the art. The test is when you actually start thinking Monkey is real – despite the fact you know he’s a furry sock with a squeezable face and a penchant for shouting the odd obscenity. There’s one point during the show where Nina goes into a sleep and leaves the stage to Monkey to take over, rendering him speechless. It’s a strange and funny addition to the show, and the long protracted silence is eventually broken by the audience rousing Nina out of her slumber. What about the audience? Her act depends largely on who turns up on the night, how willing they are to participate and how they behave on stage. It’s good to remember not to sit at the front, unless you have a bit of an exhibitionist streak and don’t mind the possibility of being dragged onto the stage and having a strange mask stuck on your face. What happens after that is anyone’s guess because Nina takes over the person’s persona by using the information she has gleaned from them. The results are hilarious. Some people become expressive in their movements when they are on the stage, while some others are more reserved. Sometimes Nina has to control three audience members. She manages to keep a scenario going through conversation, by throwing the voices of three people, controlling their masks, while also using her own voice. It’s a tricky feat and requires a lot of quick thinking, dexterity and co-ordination. She makes it look seamless, but it’s totally unpredictable and you feel it could all go a bit wrong. She is however skilful in bringing the audience with her and her easy-going nature makes people relax. There also seems to be anonymity behind the mask. Perhaps it allows people to hide and feel like they are someone else. 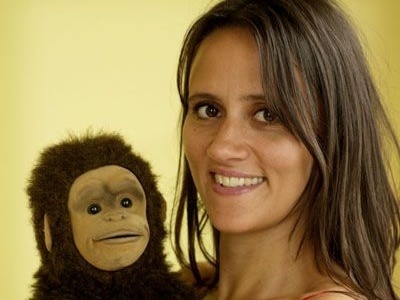 What about the real Nina Conti? She spends a lot of time occupying the minds, personalities and voices of other people, so it’s interesting to try and figure out who she is. Judging by her show, she’s a fine comedian who doesn’t take herself too seriously. At the end of the evening she pulled on a bright yellow skintight Morph suit which was back to front and poked fun at herself. She’s clever, quick-witted, fast-talking and someone you could hang out with at the bar. She’s probably never alone though and it’s likely she’ll pull a few friends out of her handbag to join you.